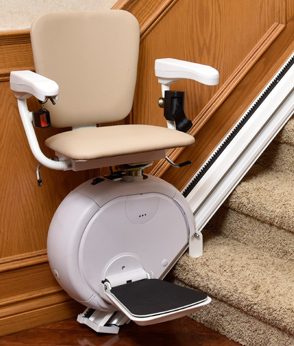 With the most compact folded depth on the market, the Savaria K2 makes it easier than ever before to own a stairlift. This smooth riding lift helps eliminate the barrier of stairs, while keeping the stairs clear for those who don't need the lift. With its extra comfortable seat, adjustable width arms and high weight capacity, this stairlift is feature-packed. The top and bottom charge battery operation means that your stairlift works even through a power failure giving you peace of mind. The K2 can be installed in just a few hours on your existing stairs. Call today and get the freedom to access your home! Household charge system: The battery is automatically charged when the lift is stopped at the top or bottom using a standard household outlet. LED Status Lights: LEDs advise of any issues, and will help troubleshoot. Other standard features: Continuous pressure operation, foldable footrest, folds up to less than 12" from the wall.